Your Spanish is like mine; acquired in the streets, it sounds like it was put through a strainer, and I love it. Here you are. In my home. On my television screen, and on my timeline. Being shared, retweeted, and mentioned by my White friends and my Dominican dad. Your goals are radical and your reach is far. Is it weird for me at 20 years old to say: “When I grow up, I want to be just like Alexandria Ocasio-Cortez.”? As a first-generation child of immigrants, I have been tasked with proving to the world that my parents’ sacrifices were indeed worth it. For my upbringing, that meant strict curfews, a sleepover ban, extra practice math, and reading subject books each summer (not because I was behind, but because my parents wanted me to get ahead for class in September), parental monitoring on all electronics, and most of all, always walking the safer path. And so I told myself I wanted to become a doctor when I was older, even though I wanted nothing more than to write. I really thought I stood a chance against Barbara Park and her Junie B. Jones series, or Judy Blume and her wonderfully resonant young adult tales. But Mami said that was no way to make money; no way to make it out the ’hood. Never one to disobey, I retired the pen and paper to be nothing more than a hobby. I was in and out of the hospital for a bit in my younger years, and loved my doctor, so I thought that career was the next best thing. Mami approved. First-gen American meant, luckily, first-gen college kid. First one to leave the nest. First one to have to explain to my parents that everyone’s major and career plan changes from what they thought it would be when they first started. When I told my mother that I no longer wanted to be a doctor — that I wasn’t even sure I ever really did, but rather told myself as much because I knew it would make her happy — and wanted to go to law school instead, you would have thought I had told her I was dropping out of school altogether. She exclaimed: How could I do this to her, after all the hard work she had put in? For a goody two-shoes like me, disappointing my parents was a worse punishment than any timeout or allowance freeze (not that those existed in our household, anyhow). Nevertheless, whether it was being away from home or the difficulty of having to figure out all things college on my own, or a combination of the two, I was resolute and unwavering in my decision. I would go on to become an immigration lawyer and help my people. Shouldn’t she be proud of that? I pleaded that, more than asked. Even that career change felt (and still feels) like a bit of a fabrication. Law school, though undeniably difficult and grueling, presents yet another clear-cut and safe path. I do hope to be able to help my communities as an immigration lawyer one day. More than that, though, looking even further ahead into the future, I dream of one day being able to bring my people’s concerns, needs, and voices up to the Hill. I used to be afraid to admit that because not only is it much less of a straightforward path than attending graduate school right after college, but it is not in any sense a sure-fire or reliable choice, made even more off-putting by the fact that there were so few people who looked like me in Congress. I told myself I would never have a chance and that my head was too far into the clouds. And then you defied the odds, Alexandria. You didn’t listen when they said you weren’t “viable.” You loaded up on bodega cafecito and put in the work. You changed into your heels on the subway platform and kept pushing. You inspired me. And I could not be happier that you reached me when you did, before it might have been too late. Before I resigned to the status quo and accepted the fate of a marginalized voice excluded from politics. When I told my Papi, he said he’s ready to lead my campaign. 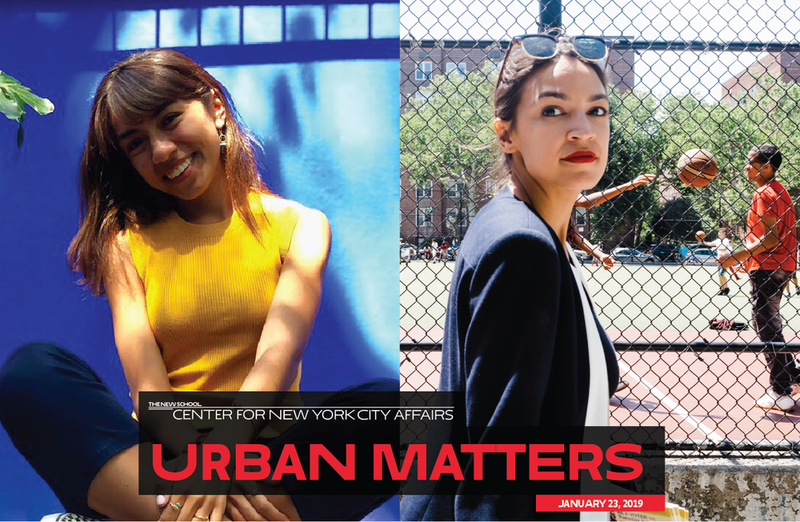 Ayling zulema Domínguez is a native of the Bronx, a graduate of Bronx High School of Science, and is currently a senior at the University of Chicago. A daughter of immigrants, her work explores identity, family, first-generation experiences, politics, and the crazy, difficult beauty of living among three cultures (Dominican, Mexican, and that of the U.S.). This article originally appeared in The Bronx Free Press in July, 2018.